Should I Heat or Ice My Injury? Shakespeare asked “to be or not to be, that is the question”. 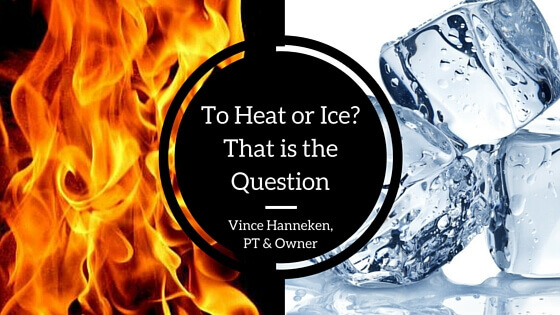 The question quite often from our patients is whether to use ice or heat with an injury or situation? There is a significant amount of information on this subject but in general patients are often told to use cold for 48 hours then heat until recovered. Yet, there is still a significant amount of confusion on the subject because quite often there has not been a specific injury but some problem that emerges for no known reason. Or one is experiencing a chronic ongoing pain or tightness from a previous acute injury that has not fully recovered. The standard protocol for an acute injury (sudden onset with trauma) such as an ankle sprain or pulled muscle would be the RICE formula for early care. Using 20-30 minutes of ice every 2-4 hours (depending on severity) and keeping compression on the injury during the day is helpful to control swelling. This approach is utilized with sports but has just as much application with every day non-sports situations with acute trauma. The gray area comes in on the question when or if I should start heating the injured area? In a perfect world, if after an injury you can continue to rest it even as you go through your day, heat may be the next step after 48 hours of icing. The acute inflammatory response has usually calmed. However, a severe strain may need ongoing ice depending on the amount of tissue damage. If you use heat and it makes the injured tissue throb and feel tighter, it is not ready for more circulation. Heat is going to increase the metabolism of the area and bring in more blood. This may increase your symptoms since the injured tissue is saying “wait, I am not ready for more fluid and pressure.” All those small blood vessels need to be able to handle more fluid. If heat creates more swelling, you should hold off on using it. Swelling creates congestion and this slows healing. Healing depends on fluid movement which means getting oxygen to the injured tissue and waste products removed. Congestion and swelling interfere with this process. The bottom line is that your body is capable of generating heat as a part of it’s physiology. When you contract muscle, it creates heat as a part of the process of doing work. When you exercise or just engage in your daily activities, your body is producing heat, pulling more blood flow to the area. Swelling may be the result since a full healing response has not occurred. Any one that has experienced an ankle sprain can attest to an ongoing swelling issue by the end of the day even months after the injury. Adding more heat may be an unnecessary step in the healing process. Initially, controlling fluid accumulation and pain are the reasons for ice and compression. Yet, ongoing use and stress to an area may necessitate the ongoing use of ice in the evening to control discomfort, tightness, and swelling. The above information has been in the literature for quite some time and to some extent is mostly common knowledge. What is not common knowledge, based on working with patients for years, is how ice can be used as an amazing muscle management tool for the active individual. Recovery is the name of the game as one copes with the daily demands of life on a body. Whether you are working all day on an assembly line, lifting kids or groceries, or are active with sports; you have to get up and do it again the next day. Where does ice fit into this very common scenario? What is going on with muscles that, by the end of the day, are feeling tight and irritable? What do you do for them – heat, medicate, ignore, stretch, or just go to bed? These are all common choices. A tight muscle means that the muscle is holding itself in a partially contracted state. The communication between the muscle, nerve, and spinal cord is excessive and to some extent is stuck in a pattern of being more on than it should be under resting conditions. This creates a condition of perpetuated waste product accumulation in the tissues with excessive internal pressure from the muscle being tight. It also prevents the muscle form receiving an adequate supply of fresh fluid to restore its ability to heal and prepare for more work when the next day comes. Under these conditions, ice shines as the treatment of choice. Ice slows metabolism in the muscle which lower oxygen demand and waste product accumulation. It also slows nerve conduction into the muscle and breaks the communication cycle. This causes the muscles to relax. As the muscle relaxes, fluids move more easily and this restores a more ideal physiology. If this is accomplished before bed, sleep will then provide a more ideal environment to further restore tissues for future activity. You may also get a better night’s sleep without those cranky muscles talking to you all night. muscles ready to work with some reserve. Calming muscles before sleep is the key and allowing your hard working tissues to have the whole night for restoration. The body does a good job of accomplishing its goals of tissue restoration with sleep when tightness has been relieved before bed. Ice is the influence of choice as the starting point to keep you in the game of life.